Often, owners opt for a SIMPLE IRA, only because there are no administrative costs associated with operating this plan. In some cases this can be a big mistake, especially if you have the ability to contribute significantly more to a 401(k) plan. While it is true that SIMPLE has no administrative cost, the biggest cost of using SIMPLE vs. a 401(k) is the income tax on the money that could be contributed to a 401(k) instead. For those in the highest tax brackets, this cost can be as high as 50 percent. What are the advantages and disadvantages of SIMPLE IRA vs. the 401(k) plan, and how can you make an informed decision on selecting the best type of plan for your practice? SIMPLE IRA is easy to set up and terminate, and it can be opened at a discount brokerage such as Vanguard so you can have access to high-quality, low-cost investments. 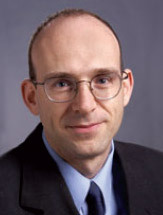 No third-party administrator (TPA) is required—operating a SIMPLE IRA is relatively straightforward and can be done by the practice owner without much assistance.1 The 401(k) with profit sharing requires the services of a TPA, so there is an added administrative cost and higher complexity compared with SIMPLE. However, a 401(k) with profit sharing allows for a significantly larger contribution (Fig. 1). There is a good rule of thumb that can help you determine which plan might work better for you. A SIMPLE IRA might be a better plan for your practice if (together with your spouse) you can contribute less than $40,000 a year and/or the cost of 401(k) employer contributions is high (with less than 70 percent of plan contributions going to the owner and spouse). 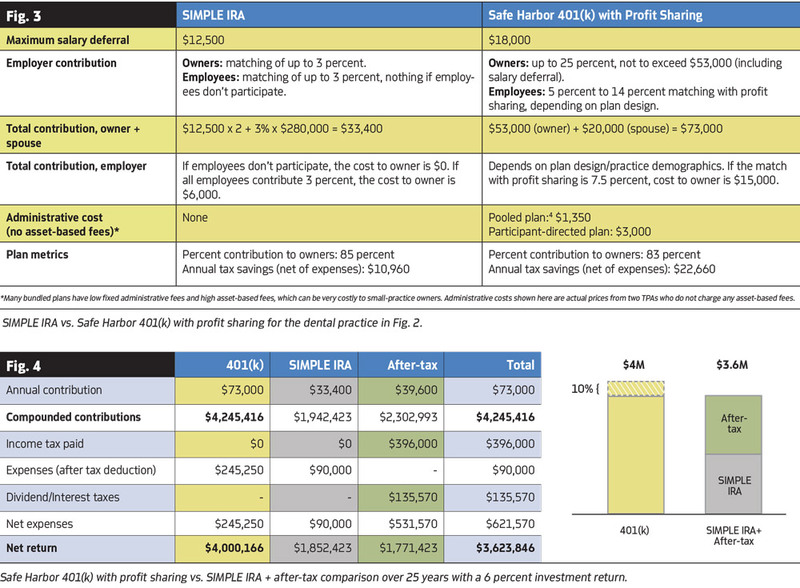 On the other hand, a 401(k) with profit sharing might be a better plan if (together with your spouse) you can contribute close to the plan maximum (approximately $73,000 if both you and your spouse are under 50) and your 401(k) employer contribution is reasonable (with more than 70 percent of plan contributions going to the owner and spouse). The decision can be straightforward if you fall into either extreme, but what if you are somewhere in the middle? What if you can contribute the maximum, but your employer contribution expenses are relatively high? For those in the highest tax brackets, higher plan expenses might still justify selecting the 401(k) over SIMPLE. What you'd need to do first is to get a plan design illustration from the TPA that takes into account your practice demographics to see what your potential plan contributions and expenses would be. 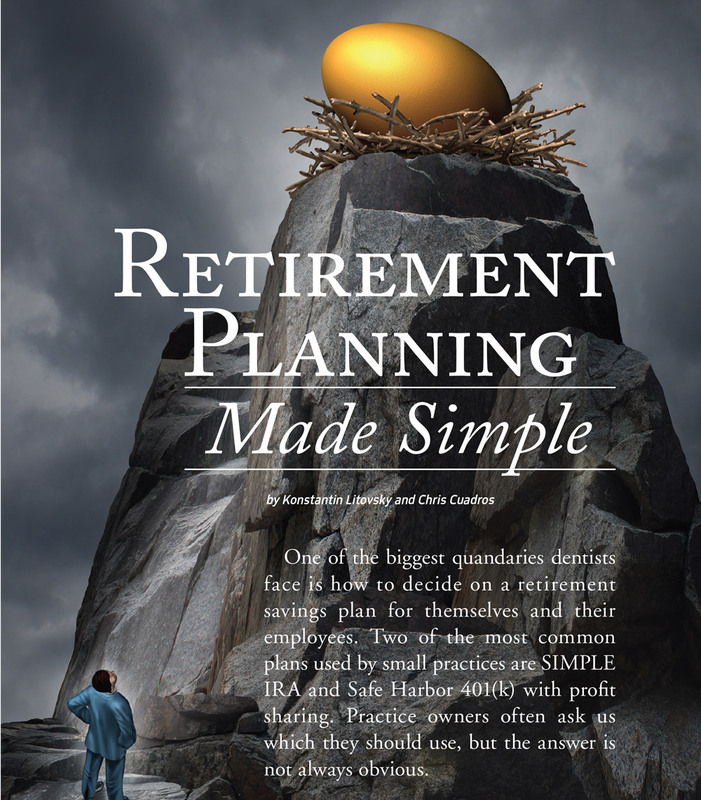 Once you have an illustration, your retirement plan adviser should do a 401(k) vs. SIMPLE side-by-side analysis that takes into account your specific situation so that you can select the right plan for your practice. The biggest downside of SIMPLE is that it has a lower contribution limit than the 401(k) plan. When you are just starting your own practice and have a significant amount of student and practice debt, SIMPLE might be a perfect plan for you. However, when your debt is mostly paid out and your practice profits grow, so does your highest marginal tax bracket. For many dentists, some of their income might fall into the highest federal and state tax brackets, 39.6 percent for federal and as high as 13 percent for state (if you are in CA). Thus the cost of keeping your money after-tax might be as high as 50 percent, so the key to successful tax planning will be to shelter as much of your highest tax-bracket income as possible, which can be accomplished with an appropriately designed 401(k) plan. While the 401(k) employer contribution for a small practice can be lower than shown in Fig. 3 (p.80), it can also be higher for a larger practice with more employees and partners. However, if the practice has several partners, employer contribution expenses will be shared among the partners, so per-owner expense for a large practice can be lower than for a smaller one. Many smaller practices with only two to four employees can have significantly lower employer contributions than shown in Fig. 3. If employees do not participate in a SIMPLE IRA, the owner does not have to match their contribution, and if they do, the owner will have to pay them a 3 percent match. Similarly, there is a 401(k) plan design that uses only matching—rather than profit sharing—that works the same way: employees get a match only if they participate, and get nothing if they don't. Even though the cost of having a 401(k) plan for this practice is higher than the cost of a SIMPLE, a 401(k) plan can provide the owner the means to save significantly more money for retirement while lowering his or her tax liability. For the example in Fig. 3, let's assume that the $73,000 is invested in a 401(k) and another $73,000 is split between the SIMPLE IRA and an after-tax brokerage account. The investment returns are assumed to be the same (6 percent) in all accounts and the investment will be made over a 25-year period. Let's compare the two approaches to see which one will result in more savings. 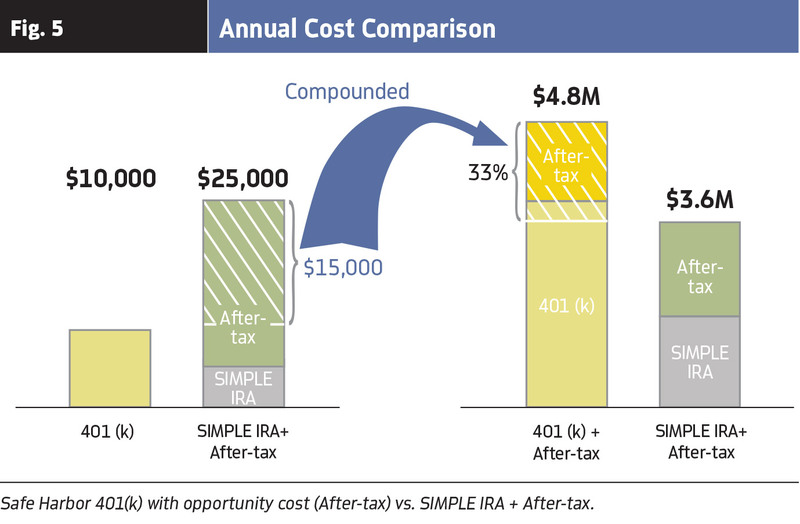 After 25 years, you will have about 10 percent more money in the 401(k)—about $4 million vs. $3.6 million for the SIMPLE plus after-tax as shown in Fig. 4 (p.80). At first glance it may appear that these strategies are not that far apart. However, net expenses for the SIMPLE plus after-tax are significantly higher, primarily because of the cost of paying income taxes, and this extra cost will be taken from the savings. If we would like to invest the same amount of money in both strategies, we need to make sure that the cost difference is included in this analysis. If the cost difference is invested (after-tax) using a 6 percent return, the resulting opportunity cost can be significant over time, so to make both sides equal, this compounded cost difference should be added to the 401(k) side. The SIMPLE plus after-tax strategy has an annual expense that is about $15,000 higher, and when we compound this amount over 25 years, it will grow to $820,000 (net of dividend/interest taxes), so the savings with the 401(k) with the compounded cost difference (invested after-tax) will be $4.8 million vs. $3.6 million for SIMPLE with the after-tax account, or about 33 percent higher as shown in Fig. 5 (p.82). If no after-tax investments are made outside of the SIMPLE IRA, the increase in retirement savings with the 401(k) over 25 years will double to about 116 percent vs. the SIMPLE IRA ($4 million vs. $1.85 million), making the 401(k) a clear winner if the goal is to accumulate the most money. 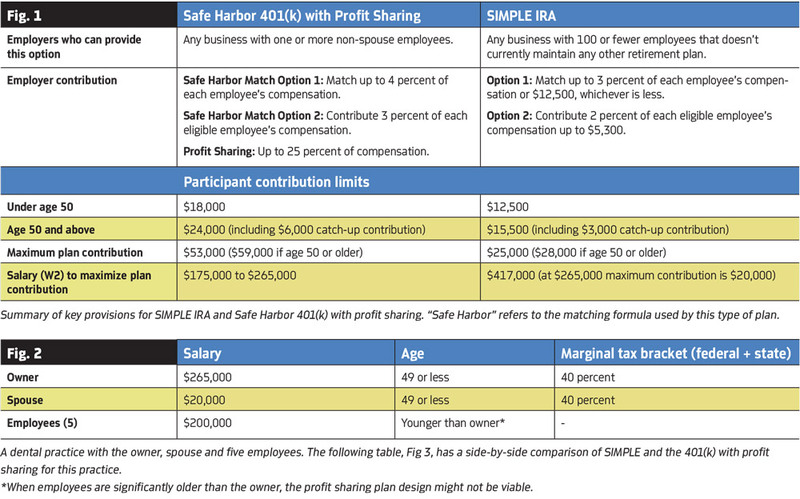 SIMPLE IRA can be a great startup plan, but eventually your practice will need a 401(k) plan, as those in the highest tax brackets can benefit significantly from making higher 401(k) contributions, which translate into larger retirement savings. There are a number of other reasons why a 401(k) plan might work better for some practices. A 401(k) plan design can be customized, which can afford advantages over the SIMPLE's standard design. For example, you can exclude some highly compensated employees from a 401(k), but you can't do that with SIMPLE. If you hire a highly paid associate, he or she will have to participate in a SIMPLE, but he or she can be excluded from participating in a 401(k) plan. A SIMPLE IRA has a single hard-coded design, while your 401(k) plan can be custom-designed to minimize your employer contribution while maximizing your own. Both SIMPLE IRA and 401(k) have a number of advantages and disadvantages, and without a complete analysis it can be difficult to decide which one would be better for a specific practice (unless you happen to fit neatly into the examples discussed above). To make the right decision, you will need to do an accurate cost vs. benefit analysis, which includes a 401(k) plan design study and side-by-side comparison of the best 401(k) plan design with a SIMPLE IRA for your specific situation. Konstantin Litovsky is the founder of Litovsky Asset Management, a wealth-management firm that offers flat-fee, comprehensive financial planning and retirement-plan advisory services to doctors and dentists. Litovsky specializes in setting up and managing retirement plans for small practices, including 401(k) and Defined Benefit/Cash Balance plans. He can be reached at konstantin@litovskymanagement.com. 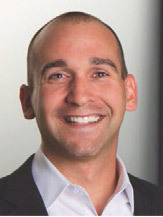 Chris Cuadros is the founder of Crossroads Tax Advisors, an Indianapolis-based consultancy specializing in accounting and tax services for dentists. Crossroads Tax Advisors work exclusively in the dental industry, and have thorough knowledge of accounting, tax preparation and planning. He can be reached at chris@crossroadstax.com.